My first new machine in roughly 10 years :)! Last time I built new machines was for crunching SETI roughly ten years ago. Unfortunately, although fun for awhile, the local electricity rate increases and monthly electric bills were killing me, so I stopped. Result was I've had more than adequate computing power for quite awhile, no need at all for further building, but recently, I thought it would be interesting to take a look at what's happening today ! Last time I looked, AMD was the brand new king-of-the-hill with the Athlon 64 X2 (about to build a fab plant in Dresden), and some folks in Israel had come up with something called Core-Duo and it was making inroads on the mobile market. I'm now taking a look today and well, well, how the world turns! AMD is now barely surviving and Intel has been riding roughshod over them ever since the success of Core-Duo in the desktop market. Wow! So, once again AMD is the dark horse with the lowest prices and there's been enough advancement since I built my X2 crew that I've the itch to build a new cruncher. I realize I should probably wait for Steamroller for best results, but chances are it'll cost a lot more and so I decided to jump in now with a used FX4300 Vishera (Piledriver) bought online at a healthy discount (Socket 939 HSF fits AM3+)! Since I've plenty of PATA hard drives on my shelf, I'd prefer to be able to use them, so I want a motherboard that supports IDE as well as SATA. I'm also interested in things like USB 3.0, and the latest SATA updates, but have no interest in CrossfireX and SLI. They're for serious gaming and my last planned gamer upgrade is an AGP Radeon 4650 (ordered from China) with my freshly installed Athlon 64 X2 4200+ with a 10% o/c -- don't know what the 4650 will do, but my current is an o/c'd 9800 Pro VIVO. Placed an order with Newegg in the wee hours of Thursday AM and today my new motherboard and RAM arrived -- Asrock 980DE3/U3S3 and 4GB G.Skill DDR3 1600. In case you haven't noticed, this is a budget build. The board has decent o/c facilities and the Piledriver core is highly clockable, so I'm expecting to have a lot of performance flexibility. I've ordered a budget video card, a refurbished XFX Radeon 6670 2GB GDDR3 which I'm expecting to be easily adequate for minor fooling around on a cruncher (though the combination may well be more capable than my designated gamer, whatever ). 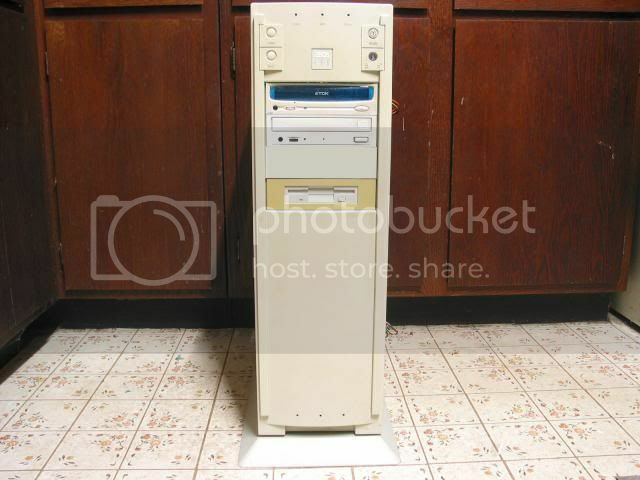 Turns out, outside of evicting a happy FIC VA-503+ board from its cozy mini-tower, my only available cabinet is an old ZEOS full tower that once housed a forward thinking pre-PCI ZEOS MB and most recently an Asus (contained a slew of PATA drives and was my core machine for years). Given the huge SATA drives available today and the very modest size of this Asrock board, that seems the perfect housing for it (overstated). The quad-core Vishera will become my core's core, serving files to other PCs and crunching video. Step one? Securing the Asrock motherboard into the ZEOS cabinet -- the fun has begun ! Last edited by TrevorS; 18th May, 2013 at 09:57 PM. PLEASE! Post pics if you can! Built my first in 5 years last year...But took the Intel path to crash and awe. Best of luck to you and your new build!! Sure, I've a camera and can take a few snaps. There probably won't be a lot to see, a ratty steel tower, a rat's nest of wires, and a few bits and pieces, but why not? When I say new build, my main focus is the motherboard and processor -- everything else I try to recycle. Intel has some neat stuff, but buying that X2 4600+ way back (my current core and cruncher) was expensive enough. Unless I want to do something requiring Intel (not likely), I prefer to steer AMD. I guess a year ago would have been tough since Bulldozer turned out a disappointment. Piledriver is only evolutionary, but a reasonable step in the right direction. If Steamroller offers sufficient advantage and I find an attractive price, there's always upgrade (as long as it's AM3+), but who knows, perhaps I'd just end up building yet another machine ! Last edited by TrevorS; 19th May, 2013 at 03:10 AM. We are in an age that is slowing realizing that we have far moreCPU power than we need. My two Athlon XP mobiles provide as much power as I usually need, it's just special circumstances where the heavy hitters make a difference. The X2's were great at crunching SETI, my various lesser processors couldn't touch them (though they contributed too, all the way down to a Pentium 1GHz). My application now is video conversion and rendering, and a single job can take over twelve hours with my X2 4600+, if that could be dropped to six or less, that would be great. Plus I'd have a couple X2's available to help with the workload (4600+ and 3800+). I considered the idea of six or eight cores, but given I'm not using professional software for mathematics, modeling, rendering, or the like, it seems uncertain I'll even hit four threads. Perhaps some games will be or have been written that use more than two threads, but from what I read, the majority are still pretty much single thread. If I'm only running one or two threads, clock speed will serve me better than core count, the rest is just benchmarks. So, I opted for quad -- a reasonable price for reasonable flexibility ! OK, had a little photo shoot this afternoon! I chose not to drop back to the raw motherboard, just started from the present. 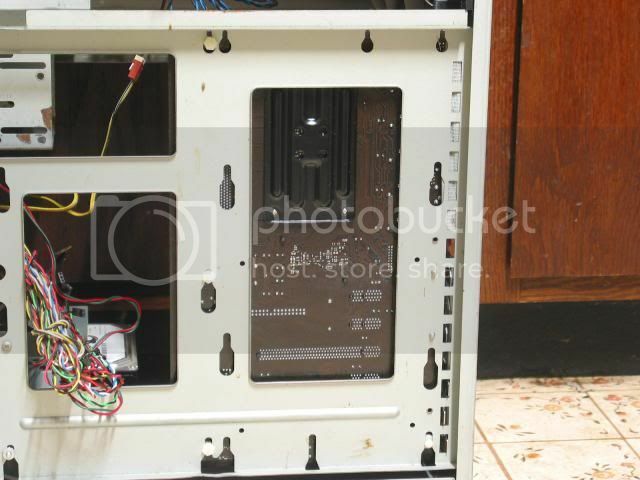 Classic full tower with a little upper cable spill since the cover is off. Welcome to the rat's nest! Close up showing rear of the board mounting. The old style cases used plastic spacers that slid into slots to support the board, plus a couple screws near rear center to anchor it. I used some newer threaded plastic spacers and nuts to more firmly anchor the forward portion. 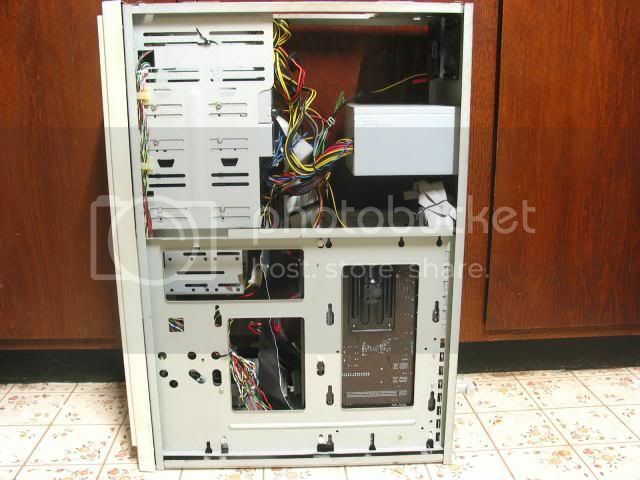 Early motherboards didn't have an I/O panel for external access, but instead used headers with cables to rear panel mounted connectors. The only way I could make the transition was with the aid of a hacksaw -- a shame, but it had to be done ! 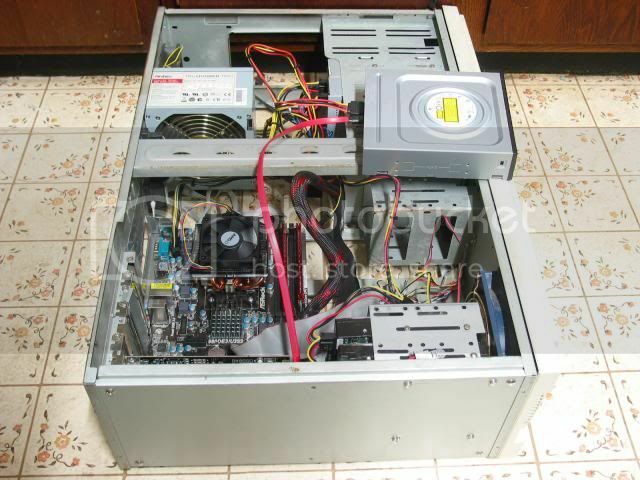 When it came time to upgrade the power supply, the original opening wasn't large enough, so more hacking. Not a pretty result and far less than perfect for controlling air flow, but it'll do. Oh yes, also awhile back, I managed to split the molded base at one corner and you can see the "repair" I made using 12AWG copper wire. Not pretty, but again, it'll do! 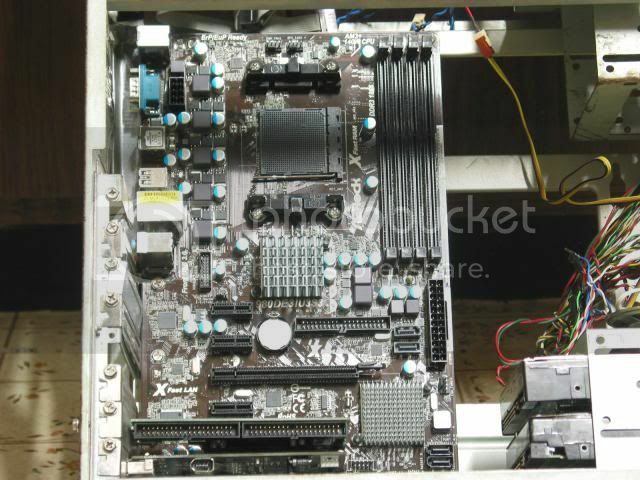 Pretty spacious interior and the Asrock board is pretty modestly sized so lots of elbow room. 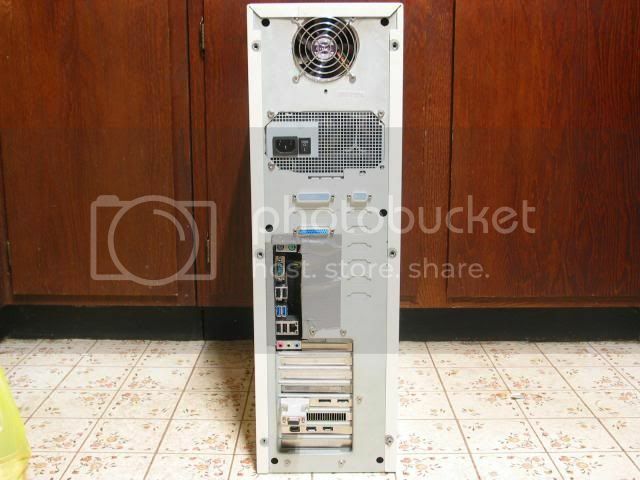 After the two optical drives and floppy, I've room for six hard drives (pushable to seven), but I'm planning on just four, don't need lots when they're available in multi-terrabyte sizes. The dual drive cage at the bottom front was originally installed at the top rear, but the long IDE cables weren't that practical and heat tends to rise, so I finally moved it down to the base -- it houses the future boot drive and a 500GB PATA. There's another dual drive cage at the bottom of the 5-1/4" stack. The two SATA drives destined for it are still in my current cruncher. For cooling I installed a large intake fan at the front bottom, an exhaust fan at the rear top, and the power supply large underside fan draws heated air from the regulators and processor to exit out the rear. 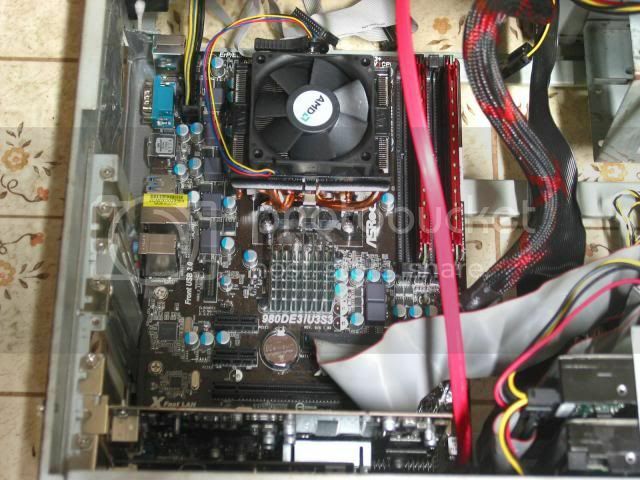 As you can see, the two motherboard PCI slots are already occupied. The board doesn't support Firewire so I installed a card I already had, plus I need IDE ports for the optical drives and 500GB PATA, another card I already had (only the boot drive gets the board IDE). Don't have assignments yet for the three PCIexpress x1 ports, but I expect the video card to arrive midweek for the x16. Oh yes, the cocked cheapo slot cover will be replaced, I've ordered a pack of ten from Newegg. PS -- OK, I used the standard "[img]"..."[/img]" formatting, so how do I make the photos display? Last edited by TrevorS; 20th May, 2013 at 08:50 AM. Is to Click on "Go advanced" then scroll down to "Manage attachments." Ouch! I ran into that on a tool site where we were discussing welder modification. I posted my modification photos using the usual technique, but they all ended up as links just as above. Unfortunately, I'm not yet comfortable with assigning my photos to others. Still, if your site cares to display them, it's a rare thing for me to delete photos from Photobucket.com. Otherwise, I'll probably be leaving them as they are. Last edited by TrevorS; 20th May, 2013 at 04:36 AM. You are at lest somewhat right to be cautious. If you upload pictures to ANY site they become the NON-exclusive property of that site and can be used as that site pleases. At the same time this and most other sites make it your responsibility to assure that you have rights to any picture you upload. Last edited by Daniel ~; 20th May, 2013 at 06:45 PM. Looks like we're just going to have photo links for this build, but here's another for you. Usually, the first snap of a build thread shows the collection of new parts, but since the final parts only just arrived, today is the day. You've already seen the board (though mounted in the case), so I just included the box in the photo. To the left you see the Asrock motherboard box, next is the XFX 6670 video card box with the card itself at the front left. 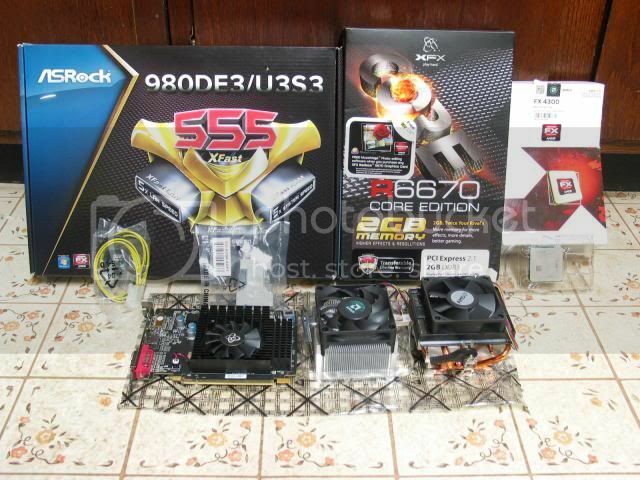 Last on the right is the AMD FX4300 box and below it the processor. 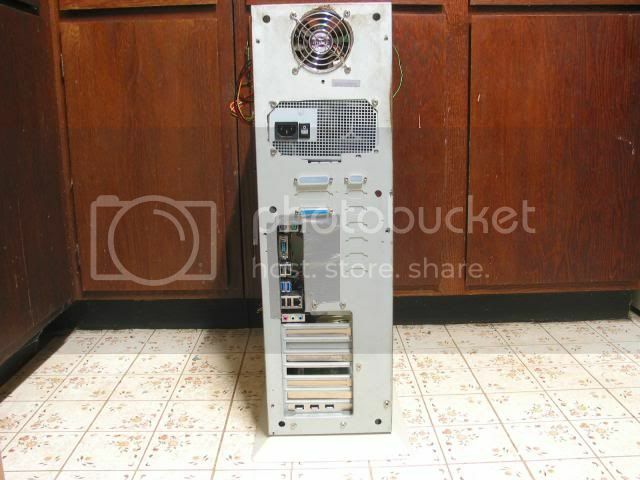 There are two HSF assemblies in the front, the center having come with the processor, the right being an Athlon 64 X2 HSF (new via Ebay), both AMD. Since the 4600+ was spec'd at 65W and the FX4300 at 95W, and the X2 HS has a large copper base and four heat pipes, whereas the other is physically smaller, almost entirely aluminum, and without heat pipes, which HSF do you think might be the better choice for my build? Yeah, I'm thinking that one too! Guess I'll find out how well an X2 HSF fits on an AM3+ socket. The last two items in the photo are a DVI-I to VGA adapter for the video card (I've none of DVI-I, Display Port, nor HDMI hookup) and a 4pin to 8pin cpu +12V adapter (my PS is pre-8pin). The video card is obviously no big deal, between its stubby length, modest HSF, and lack of an external power connector, I shouldn't and won't expect great things, but then again, I didn't intend it for great things, just minor fooling around ! Guess it's time to start building and testing. Last edited by TrevorS; 20th May, 2013 at 10:08 PM. Time for an update! It's been something of a slog, but with the exception of one major drag, it's worked out OK.
1) Doesn't help to confuse a USB header for panel I/O. Couldn't understand why the cpu fan wasn't starting! 2) Turns out my PS does have an 8pin +12V connector. Using the 4pin with a 4to8 adapter resulted in thermal shutdown, and that had me chasing my tail for ages. Using the 8pin solved the problem. (3) Seems on a modern motherboard, WinXP original can't complete cleanly (at least with working video) and the board drivers can't install reliably without SP2. Solution is to reboot and enter Safe Mode after WinXP video goes bananas, then install SP2, after which problem solved. (4) When installing a PCI-E video card, it sure helps if it's a working card ! The first three difficulties were surmountable with materials at hand, banging my head against a wall took time, but I eventually figured them out. However, head banging wasn't enough for the last one, have to return the video card, but I think I can borrow an old one from a build I'm doing for a friend. I took a couple photos of the PC layout for initial test and install. Since the DVD and CD drives are IDE(PATA), and the PCI IDE controller install has to come after the PCI-E video card, I hooked up a temporary SATA DVD drive. Took one shot just to showcase that massive X2 heat sink. It's consistently holding the cpu temp to just 5C above the motherboard. Last edited by TrevorS; 22nd May, 2013 at 03:47 AM. "Dude! You should try Mint 15!! 4. I really hate it when a part WAITS until you start a new build to kick the bucket. There something in my mind set that will not let me grasp that a card that worked fine in the OLD build, WAITED to die in order to screw up not only my new build, but to blow my budget to hell as well! Last edited by Daniel ~; 22nd May, 2013 at 06:10 PM. I downloaded the drivers for the used PCI-E video card and it came right up, a pleasant change from the headbanging with the refurb! Unfortunately, I then found myself unable to convince the OS to accept the PCI dual IDE controller driver (Maxtor/Promise Ultra100). After battling with that for a couple hours, I finally gave up -- the Hardware Manager device exclamation point laughing at me. Strangely enough, when I fired it up again today, the controller BIOS reported for search duty during boot to say there were no devices! Wow -- I've no idea what trick I tried that somehow worked through delayed action, but that was normal behavior! I connected the two drives with ribbon cables, secured the cables clear of the CPU HSF, and lo and behold, the two optical drives came online. I'd wanted to put both opticals on one card port, but the distance is just too great, so I settled for installing the 500GB as the motherboard IDE slave drive. Probably just as well since the motherboard port supports higher than ATA100 speeds. 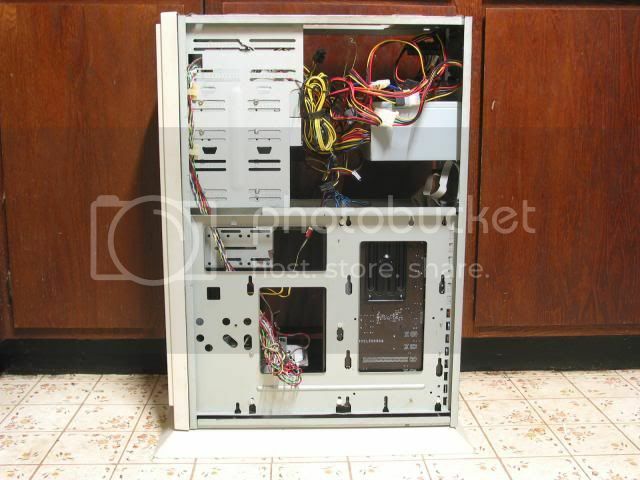 In any case, all that's left is install the two SATA hard drives in the mid cage (no big deal) and replace the cocked slot cover and borrowed video card. Since I'll fool with the machine awhile before making it my new core, the drive transfer will wait, and so for all practical purposes, I think these last two photos complete the build thread. Everything short of the two SATA drives, replacement slot cover, final video card, installing the base, and buttoning up. PS. Forgot to mention, I ran it for several hours today with the case closed, the hardware monitor reported 36C and 39C for the motherboard and CPU temps. 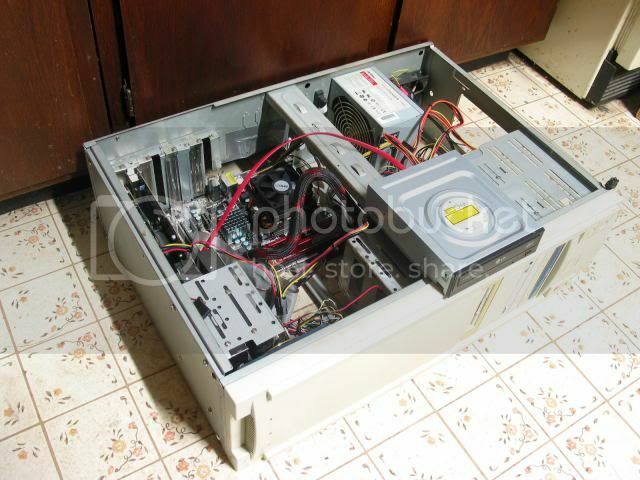 A lot of air moves through that case despite the hack job in the back. Given how warm that upstairs room was today with two computers running and no ventilation, I think that's pretty good. Last edited by TrevorS; 23rd May, 2013 at 04:19 AM. Yeah, that's how I found out to. Do you have a particular requirement that requires you to use XP and Win 98? Last edited by Daniel ~; 23rd May, 2013 at 03:27 AM. The comment elsewhere regarding Linux bloat was interesting, and not at all hard to believe. I'd wondered about Linux as a substitute for Windows and put together some "Distros" and documentation from the internet (still have them), but never went any further. 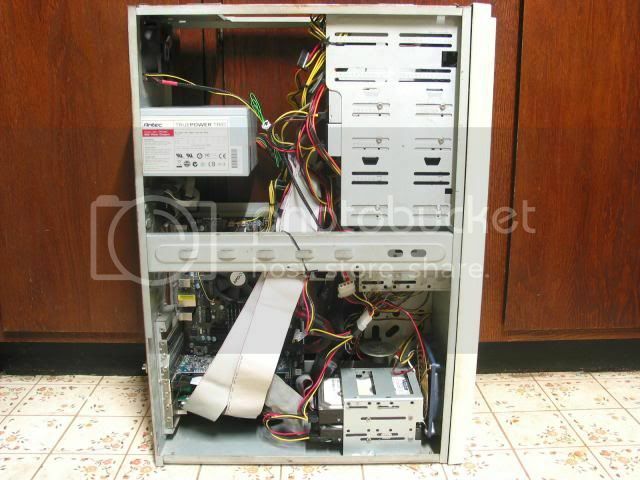 My dual-boot gamer Win98SE is primarily for the purpose of supporting games released pre-XP. However, I like Win98 and it's kinda nice to have the occasional opportunity to get my feet wet ! (Early processors are much happier with Win98 than later releases, far less overhead). My very first hands-on OS was Win3.1 (installed with floppies and personalized like crazy via config.sys and autoexec.bat). It was actually fun -- can't say that for the recent entries. Win95 started the hands-off revolution and seems like WinXP pretty much finalized it. Later entries have just catered more and more to focus group "improvements" that move the OS further and further into the background. No doubt that's great for the marketeers, but it does little for me! I'm a PC hobbyist and have a number of machines in various states of repair and disrepair (including boards in boxes) and having to buy a Windows license every time I want to breath life into one of my creations is insane -- it's just me, not a fleet of owners. Furthermore, I can't afford it. This wasn't a problem in the days pre-WinXP, but MS has been scavenging for profits ever since. If Windows software isn't easily affordable to the hobbyist, the hobbyist isn't going to buy it. Don't know if that satisfactorily answers your question, but it's my best shot ! Last edited by TrevorS; 23rd May, 2013 at 05:15 AM. Booman and I have been working on getting PC Games...ie Windows games to run in Linux. Games using directX 9 Almost Always work!! We gotten all but one or three of them to run , most run perfectly and look as good as they ever have. Grab a spare hard drive and install Mint 15 and let me show you how to spend your money on games and hard ware rather than on your OS. As far as "Bloat" goes, one man's bloat is another man's full featured OS! Last edited by Daniel ~; 23rd May, 2013 at 06:23 PM. Back to the build, I had to pull the video card late last week to reactivate the original incarnation of my "next build" which is for my neighbor. So, the system sat dead for some five days, but I ordered a new video card for it and that arrived Tuesday. However, as I mentioned earlier, my purpose for this machine is as a cruncher, not a gamer, so the intent for the new card is an AMD Stream co-processor to work with the FX4300 cpu. Just installed it Tuesday evening (had to battle again with the Maxtor Ultra 100 PATA controller driver) and ran a few video benchmarks for fun, but as I said, that's not the intent. The Sapphire Radeon 7770 has 640 Stream processors that I'm hoping will be helpful at least a good part of the time (video crunching time). The system's looking good and stable, but that card is a shoehorn fit on my motherboard. It occupies two slots and adjacent are my only PCI slots, which are critical for supporting my PATA optical drives and IEE1348 PCI card. My original layout positioned the dual port PATA controller in the higher PCI slot, but that interferes too much with internal air flow to the video card fan, so I stretched the PATA cables a little further to move it to the bottom-most slot, the cutdown Firewire card moving adjacent the 7770. Still isn't ideal I guess, but I think it should do pretty well ! Now, if only that PCI Maxtor/Promise Ultra100 dual channel PATA controller will continue to initialize at boot ! Last edited by TrevorS; 29th May, 2013 at 09:17 AM. Last edited by Daniel ~; 30th May, 2013 at 02:57 AM. 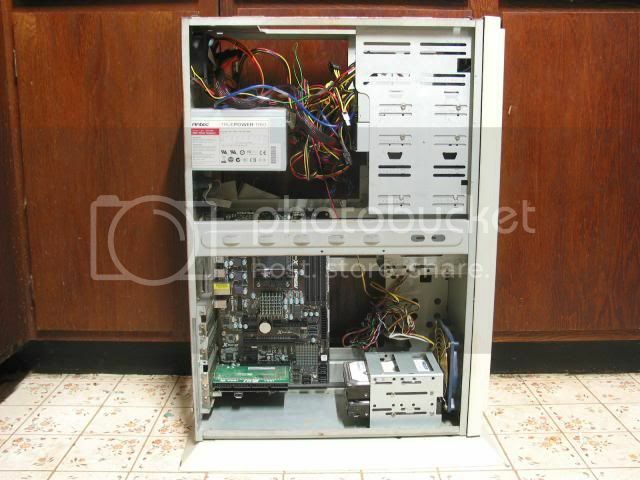 I had three PCI dual port PATA controllers, the Maxtor Ultra 100, a Rocket 100, and an Abit 66. Now I've four since while deep in the throws of trying to get the Maxtor/Promise driver to install, I ordered a Startech dual port PATA expecting to need it -- now it's another spare. Problem with the Rocket and Abit is they're intended for hard drives, they don't do so well with opticals. A flexible company that Startech, they also made the rear slot covers I bought. Speaking of which, I replaced the cocked cover and cut a shorty to fill that unsightly slot gap above the I/O panel audio jacks. Guess I'll throw in a photo since it does look a bit better back there. Had to install an adapter for my VGA cable. Now I just need to locate the other five screws for the cover. Pretty sure they're hiding somewhere in the carpet adjacent my desk. Last edited by TrevorS; 30th May, 2013 at 01:21 AM. Last edited by Daniel ~; 30th May, 2013 at 02:59 AM.